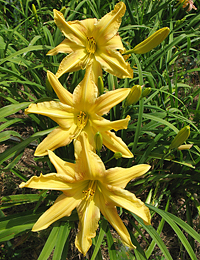 Hemerocallis ‘Secret Agent Babe’ is a high percentage polymerous 2006 introduction. 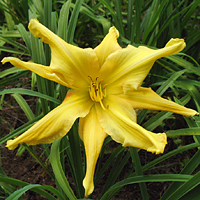 H. 'Secret Agent Babe'... (Baxter, 2006), Seedling #B05-350, Diploid, 7½", 28". Pinched crispate unusual form with top-notch pedigree (H. 'Carolina Octopus' × H. 'Carolina Flying Poly Possum'). 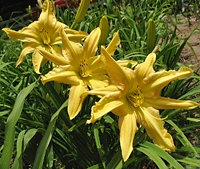 I registered the flower as 75% polymerous, however, during the 2011 & 2012 bloom seasons it was 100% polymerous. When I relocated the garden in the spring of 2007, I thought I had lost H. 'Secret Agent Babe'. I was so disappointed until I rediscovered it during the 2011 bloom season in a bed of plants that had lost their tags. Now, in the fall of 2012 and six years after official introduction, I feel that it is being introduced again for the first time. The narrowness of petal is from the pod parent H. 'Carolina Octopus'. The pronounced mid-rib creating the crispation and slightly red eye is from the pollen parent H. 'Carolina Flying Poly Possum'. The red eye can be very faint at times but is never heavily pronounced. The base color is a very clean yellow and actually comes from both parents despite the fact that the "Octopus" is red. 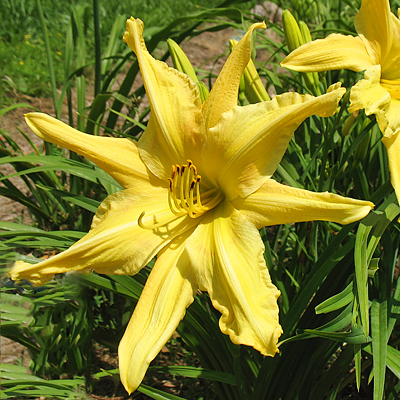 The yellow flower H. 'Almost Paradise' is the pollen parent of the "Octopus". 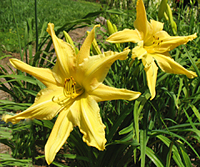 H. 'Secret Agent Babe' is mid-season bloomer, repeats, and is dormant. 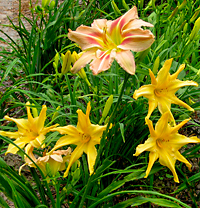 Definitely a plant to have in your arsenal if you are breeding for polymerous daylilies.